Sunday night down in the bowels after the longest weekend known to man isn’t the sort of place you’d expect to have your flagging spirits lifted, your feet compelled to once last (dad) dance and performances as intense as they are fun. But that’s exactly what Nelson Can and LIINES achieved. 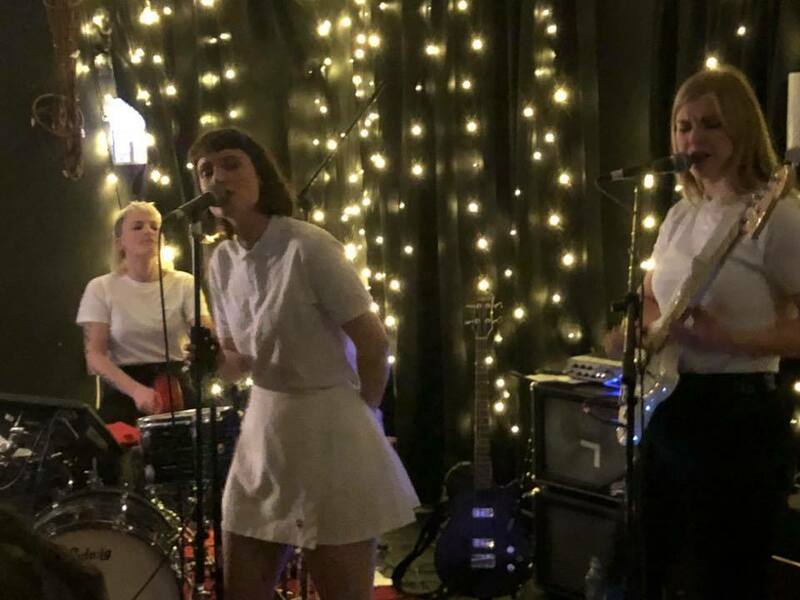 2017 has been a year of transition for LIINES with the departure of founder member Steph and the arrival of Tamsin on bass, but they leave it armed with a debut album ready to be launched early next year and feeling like they’ve recaptured the momentum and excitement that built around the release of their single Never There which finishes the set tonight. 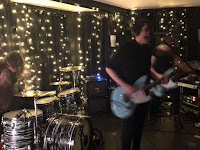 Set against just a backdrop of fairy lights and the improvisation of a lamp strategically placed on the floor behind the speaker by a creative member of the audience they power through most of the tracks from the debut album. Well they do once they borrow Nelson Can’s snare drum after Leila breaks hers during opening track Shallow. It doesn’t break their momentum though, breathlessly (almost literally in Zoe’s case) powering their way through a nine-song set that sets the weary pulses of the crowd racing. 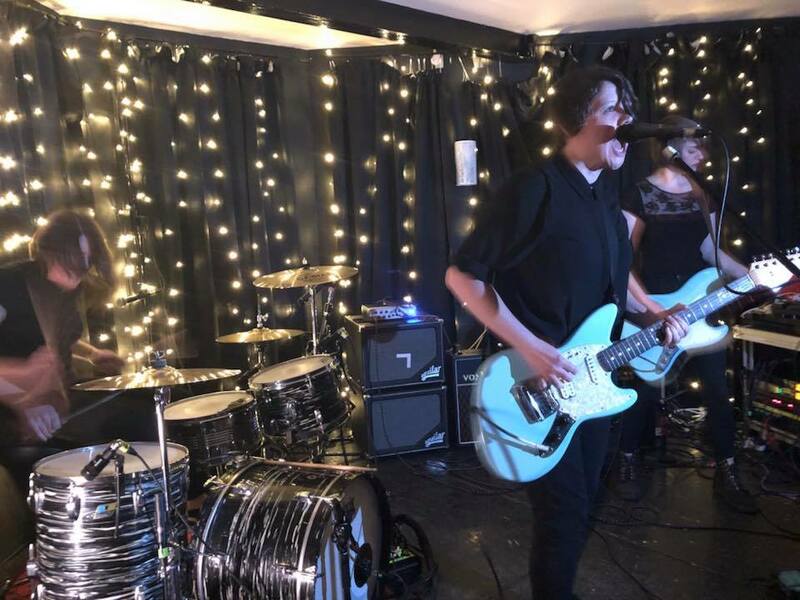 Recent double A side singles Be Here and Disappear are even more raw, ferocious and exciting live than on wax. The Peer Hat’s sound system is so clear and sharp that you can hear absolutely everything and that simply serves to accentuate the magic of LIINES and what they do best. Less familiar songs like Never Wanted This and Hold Your Breath are equally as pounding and punishing, driven along in a whirl of arms and sticks by Leila and given a little light and shade by Tamsin whilst Zoe exorcises her demons in the way she knows best, lost in the performance of these songs. 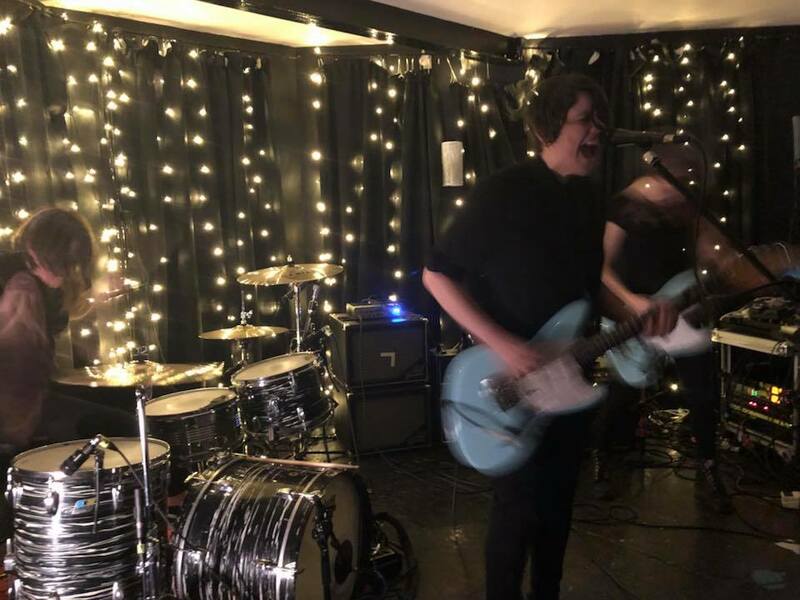 The response they get at the end tells us just how much love there is for LIINES in this room and in this town, a band that wear their black hearts on their black sleeves. It doesn’t take long for Manchester to fall head over heels with Nelson Can. When they tell us near the end of the set they need to sell merch for the tickets back to Copenhagen, they’re told in no uncertain terms they have to stay. 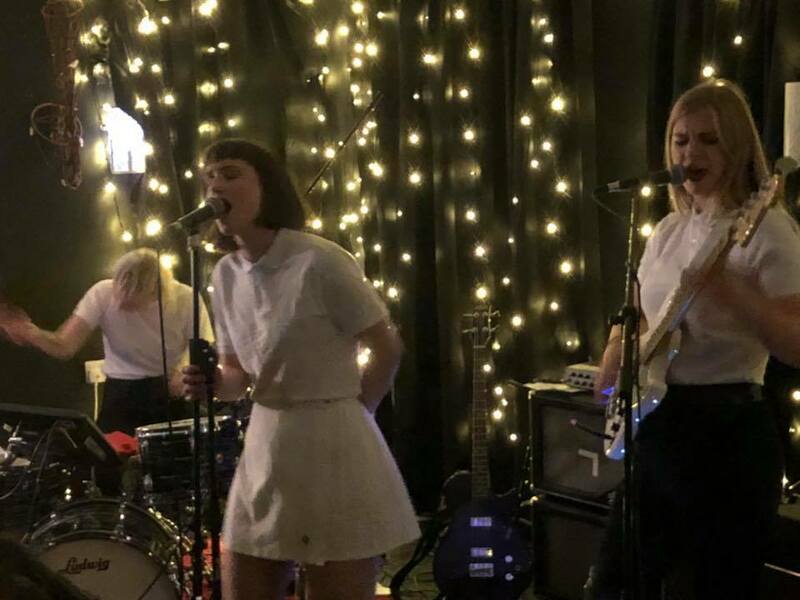 This is one of those magical sets where the audience fall in love with the band and vice versa, all fuelled not just by the magical twelve songs they play but by the boundless energy they exude and how genuinely they’re taken aback by the audience’s response to them. They charm us by telling us how they learnt to play snooker in Middlesbrough the night before, had pie for tea like it’s some undiscovered foreign delicacy, Selina spending parts of the gig amongst us demanding people dance and Signe’s breathless excitement at the response they get from the Sunday night crowd. 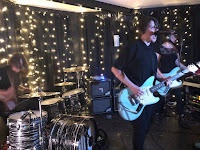 Their set covers songs predominantly from their 2014 album Now Is Your Time To Deliver, its accompanying EP2 and most tellingly their exuberant joyful EP3. Whilst Break Down Your Walls, which they proudly tell us is featured on Made In Chelsea, is the stand out track of the newer ones, You Are Digging Your Grave, Downtown and Miracle equally demand our attention as Selina, Signe and drummer Maria combine vocals, harmonies and, we can’t stress this enough, an absolute joy of performance that make our weary feet and bodies move. Call Me When You Want To Get Laid is introduced with a wicked laugh and as Selina bounces around the crowd you wonder why people are not falling at the feet of this wonderful band. There’s moments where they rock out, there’s bits of bubblegum innocent pop, even a bit of ska at points, but it all gels together perfectly in an infectious and exuberant call to shed your inhibitions and join them in their abandon. They finish with a riotous Are You High as part of an impromptu encore where Selina laughs she took a request for it and didn’t tell the rest of the band. By the end there isn’t a single person in the room who isn’t utterly overwhelmed and in love with them. In under an hour they woke us from our Sunday night malaise and sent us into the dreary rainy Manchester night hoping it won’t be another two and a half years before they come back. Whilst the likes of Dream Wife and Black Honey are (rightly, because they’re brilliant) garner the critical plaudits, Nelson Can are the ones. One of the gigs of the year. Nelson Can's official website can be found here. They are also on Twitter, Facebook and Bandcamp, where you can buy their music. They play London Lexington (November 30) and Brighton Green Door Store (December 1).